The IT chair with a FIVE year warranty…..
Just a few years ago REMPLOY were making great furniture for schools, libraries and other organisations………then sadly the government ‘pulled the plug’ and that was the end of the line for some great educational chairs. 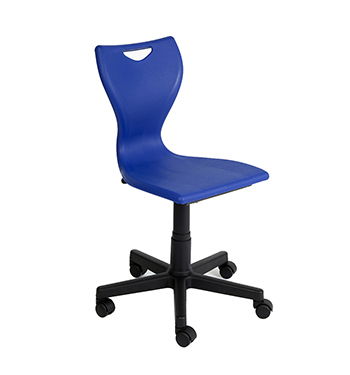 However, the good news is that another UK firm has taken over production of the best of the Remploy chairs, the EN series. The EN series chairs are known for their superb build quality, ergonomic design and comfort……as well as having a FIFTEEN year warranty for some of the models. The EN 50 IT chair is, in our opinion, one of the best IT chairs available. A gas lift mechanism adjusts seat height from 390 mm to 520 mm and the superb ‘flexi-back’ relieves back pressure and tension. Fitted with a five star base and a choice of castors, glides or pressure locking castors the EN 50 is not only well engineered but looks great in a choice of 15 attractive colours…. in schools, colleges and universities… AND it has a FIVE year warranty. Martin Evans who will be pleased to assist. Does the way a school treats parents make any difference to the way parents respond to the school? It is one of those things that generally just happens: the school has a way of liaising with parents, and very quickly it becomes the natural and obvious way of doing things, continued without much change from year to year. And yet several analyses have shown that there are currently four different models that schools in the UK use when liaising and dealing with the parents of their pupils and students. More to the point, the approach that a school adopts to dealing with pupils and students can have quite a profound effect on the way parents respond to and support the aims and actions of the school. In short, the support that a school gets from the parents is dependent on the way the school treats the parents in the first place. The view that there are four different ways in which parents can be dealt with by schools, and that this affects the way parents co-operate with the school, was originally set out in a lecture by Tony Attwood at the University of East Anglia. This lecture has now been reproduced in a brief summary paper, and this is currently available for download free of charge. To obtain the article simply complete the form by supplying your email address (no other information is requested), and a copy of the article will be sent to you. Your email address will not be used for any other purpose, nor will it be passed on to anyone else. Spellzone have added a Spelling Ability Test to their well established on-line English spelling resource. results provide evidence of each student’s attainment. Creates an individual Personal Course Pathway. Automatic re-testing updates scores and pathways. Suitable for students aged six to adult. Teaches all English spelling rules. Suitable for students aged nine to adult. User created subject-specific or ‘problem’ words. Word lists give access to thousands of interactive spelling tests, games. All word lists can be printed as worksheets and translate into 90 languages. Spellzone tracks all activity and progress. Easy for teachers to report on student attainment. A complete resource to help improve literacy levels in your school! FREE 30 day trial of ALL Spellzone resources followed by a half price first year subscription! *Standard school annual subscription £295 plus VAT. Small school rate available for up to 20 students. School Sport Bottles – NDA Packaging Services are an established, leading UK schools and business water bottle supplier. Postal address: NDA (Packaging Services) Ltd, PO Box 516, Swansea, SA8 3YN, UK. Interactive PE Software – 8 titles packed with hundreds of stunning curriculum 3D animations describing difficult to understand concepts for PE. There are texts, voice-overs, quiz zones, drag and drops, multiple choice quizzes and more. Request your 14-day free trial of PE Educational Software Solution. Search Taster Day Events – helps PE teachers to discover an array of events to book students on to, such as university and college taster days, workshops, residentials, open days, outreach events and widening participation opportunities. PE Teaching Resources – We’ve worked with teachers, examiners and subject specialists to develop a range of stimulating and engaging photocopiable and editable teaching and learning resources for PE. Whether it’s Key Stage 3, GCSE, BTEC or A Level, we’ve got it covered. And if we haven’t? Let us know!